While green infrastructure has great potential to improve communities in all geographic contexts, the majority of existing literature and support for green infrastructure is biased toward large cities and highly urbanized communities. 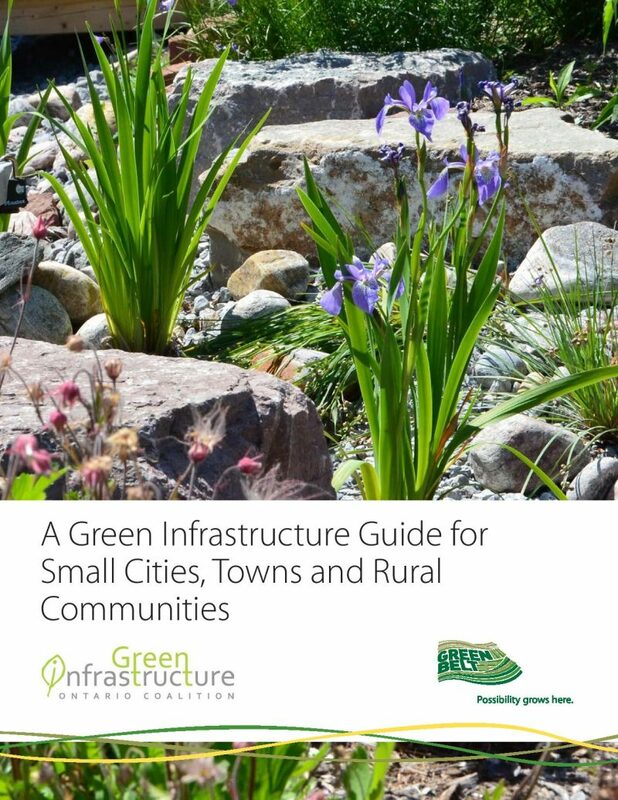 GIO and the Greenbelt Foundation have teamed up to develop a new guide for towns, small cities and rural communities that are interested in harnessing the power of green infrastructure. There is ample evidence supporting the stormwater management, air/water quality, ecological and human health benefits that green infrastructure can provide in an urban setting. In 2016, the Friends of the Greenbelt Foundation asked a team of graduate students from the University of Toronto to investigate the benefits of small-scale green infrastructure for small cities, towns and rural communities located throughout the Greenbelt. Their research showed that green infrastructure has considerable value for small settlements, as well as the natural heritage and agricultural systems that form the surrounding countryside. In response to this finding, the Greenbelt Foundation and GIO saw the need for guidance specific to green infrastructure in small towns, communities and rural settlements. This new guide offers an overview of what green infrastructure is, and how it might fit into different land uses within peri-urban landscapes. The guide offers recommendations for the application of 17 different types of green infrastructure. You can read more and download the guide here. The Greenbelt Foundation has also created an informative website with additional resources for residents wishing to implement projects on their own properties, including a wealth of resource and programs for residents of southern Ontario. Visit the new webpage at: www.greenbelt.ca/green_infrastructure. Residents looking for instructional resources and grants can also explore GIO’s membership page or contact us for further details.